DRC May Hike Tax on Cobalt by Making it "Strategic"
The tax could more than double to reach 5 percent if a revision to the country’s mining code, last updated in 2002, is approved. The world’s top cobalt-producing country could more than double an export tax on the metal as demand and prices continue to climb. A proposed revision to the Democratic Republic of Congo’s (DRC) mining code could classify cobalt as a “strategic substance,” resulting in a tax hike, according to Mines Minister Martin Kabwelulu. Under the country’s current mining code, cobalt is classified as a base metal, alongside copper. If the proposed revision goes through, the royalty on base metals will climb 1.5 percent, rising from 2 percent to 3.5 percent. The revision has been approved by the country’s lower parliament, and is now before the Senate. Once a decision is made regarding the changes, the DRC will be able to select “strategic substances.” If cobalt is placed in that category, it will be taxed at rate of 5 percent, more than double the current 2 percent. Industry participants say a tax increase could deter further investment in the DRC, which produces over two-thirds of the world’s cobalt. The government has countered that its rates are still lower than competitor Zambia, and has noted that more revenue is needed for the state. Kabwelulu also noted that any tax changes will be applied to all projects immediately. Bloomberg reports that the royalty hike could have the greatest impact on Glencore (LSE:GLEN) because it is the largest producer of cobalt and copper in the DRC; the company is also the world’s top cobalt producer. 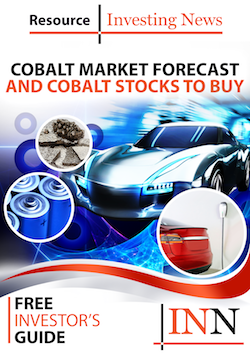 Demand for cobalt is expected to increase moving forward due to its role in lithium-ion batteries, which are used to power electric cars. These vehicles are becoming more common as many countries move away from fossil fuels to meet emissions targets. Each lithium-ion battery contains 15 kilograms of cobalt chemicals, which are primarily produced in China from DRC feedstock. In 2017, LME cobalt prices gained about 120 percent on strong demand and supply concerns. Prices went from $32,500 per tonne at the start of the year and had hit $75,000 by early December.